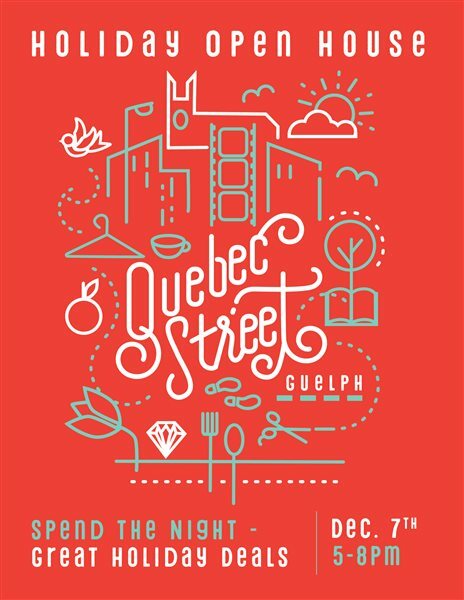 Organized by independent business owners and the Downtown Guelph Business Association, the Quebec Street Holiday Open House is a celebration of the uniqueness of Quebec Street. With its diverse shops, unique offerings and historic buildings, Quebec Street is the perfect setting for a festive shopping experience. Merchants will be welcoming holiday shoppers this Friday December 7th from 5pm to 8pm. Take advantage of one-night only discounts and nibble on sweet and savoury treats as you browse for gifts. Adding to the festive atmosphere, Victorian Carollers will wander Quebec Street singing traditional Christmas carols. In keeping with the spirit of giving, Quebec Street merchants will be collecting new, warm socks in support of the Toasty Toes campaign. Your donation will be passed on to those in need, and may also qualify you for special treatment and awesome deals. Quebec Street business owner Heather Grummet says “after 19 years as a Quebec Street merchant, I look forward to the Holiday Open House as a great way to celebrate the season with both new customers and those I have known for years. I’m excited we have come together this year as a street and a community to create an event in support of the Toasty Toes Campaign”. Continuing the holiday vibe, shoppers can wander over to Old Quebec Street Shoppes for the 2nd annual Christmas Village Market. Candy cane striped booths and festive décor will create the magic and romance of a traditional European Christmas market.